Ischaemia is a lack of blood flow to an organ. It may be complete or partial. Prolonged ischaemia may culminate in infarction which is the necrosis of tissue due to a disruption to its blood supply. Ischaemic bowel loses the ability to contract. Bleeding may occur. Infarcted bowel also becomes permeable to bacteria and septicaemia can develop. The necrosis of the wall of the bowel can culminate in perforation when the structural integrity fails. The process of bowel ischaemia is painful and the presentation of acute ischaemia is usually with abdominal pain. Chronic, lower grade ischaemia may also present with pain. The necrosis in acute ischaemia affects the mucosa first, then the muscularis propria. The death of the mucosa results in a loss of the normal mucosal markings. Extension of the necrosis into the muscularis propria makes the bowel thin and feel flimsy. There is often discolouration which may vary from grey-green to black. 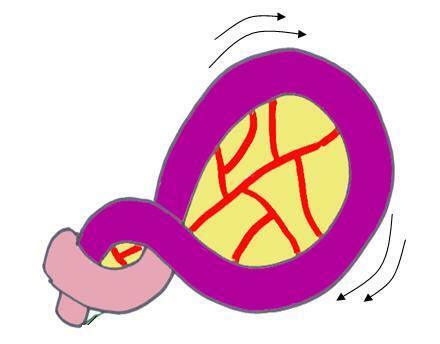 There is little overlap between blood vessels in the segments of the bowel that they supply, so occlusion of a single vessel may be sufficient to render the segment of bowel it supplies ischaemic. Similarly, the distinction between adjacent vascular territories can be quite sharp and the macroscopic changes of ischaemia may show quite abrupt transition to normal bowel. Bowel which shows a region of ischaemia. Bowel infarction may be either arterial or venous in nature. In arterial infarction, the arterial blood supply to the infarcted segment of bowel is blocked. The bowel is starved of blood and tends not to be haemorrhagic. In venous infarction occlusion of the venous outflow causes stagnation of blood flow in the affected segment of bowel: the arteries may remain open but the outflow obstruction prevents the circulation of blood. The infarcted bowel becomes engorged with arterial blood and is haemorrhagic. As the ischaemia progresses, deeper layers of the bowel wall become necrotic. 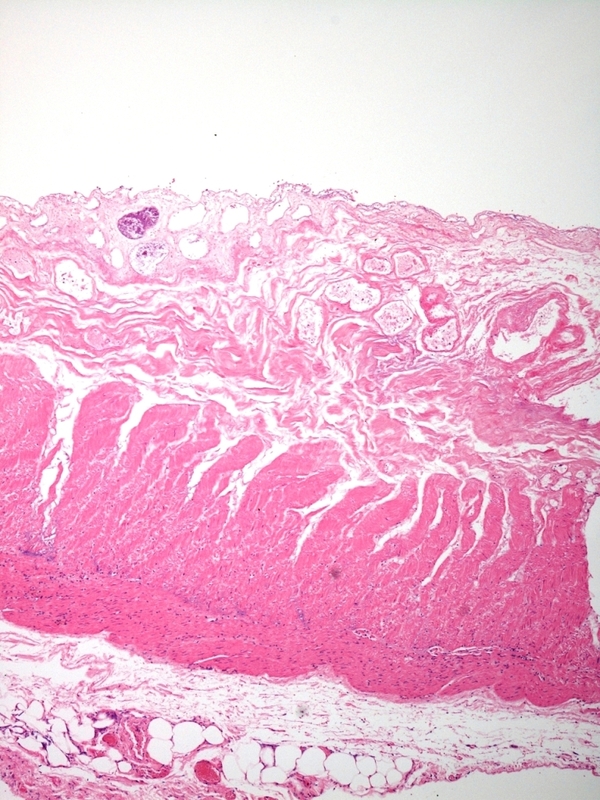 In this image the entire mucosa and submucosa are necrotic, as is much of the inner layer of smooth muscle. In fully developed ischaemia the entire thickness of the bowel wall, including all of the muscularis propria, is necrotic. 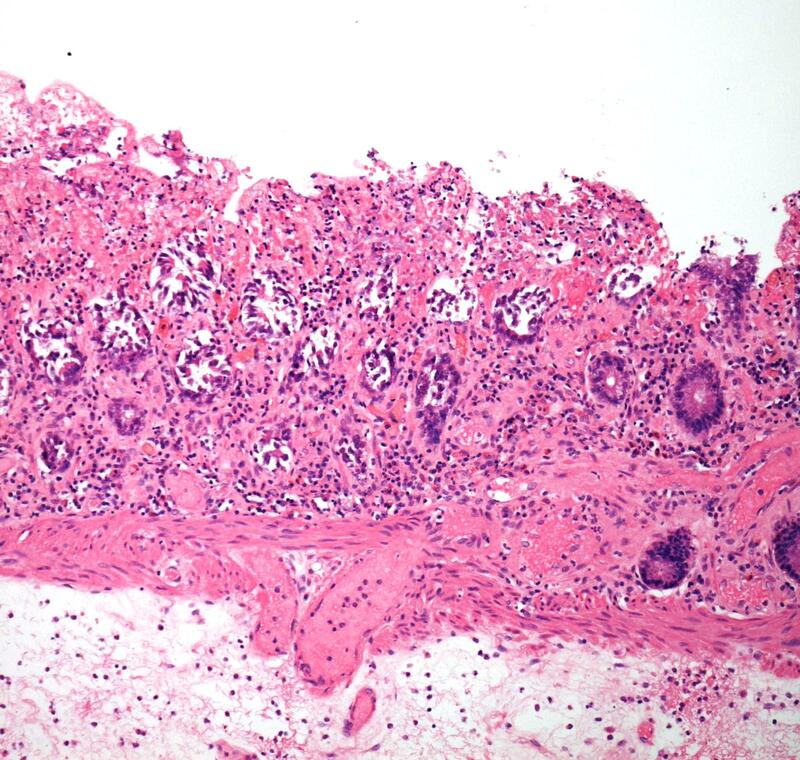 Bowel in this state of transmural necrosis is very likely to perforate. Chronic, lower grade ischaemia, which may be intermittent, produces less dramatic changes than acute ischaemia. The mucosa remains the most susceptible part of the wall of the bowel to the effects of the ischaemia and can show gland loss, fibrosis and erosions. The causes of bowel ischaemia include the following. Hernias are defects in the abdominal wall. Loops of bowel can protrude through them. If the neck of the hernia becomes constricted this can block the blood flow in the veins which drain that segment of bowel (strangulation); the lumen of the bowel becomes obstructed. It is usually only loops of small bowel that enter hernias. Volvulus is a process in which a loop of bowel becomes twisted round on itself causing constriction of the neck of the loop of bowel with obstruction of both the lumen and venous drainage. 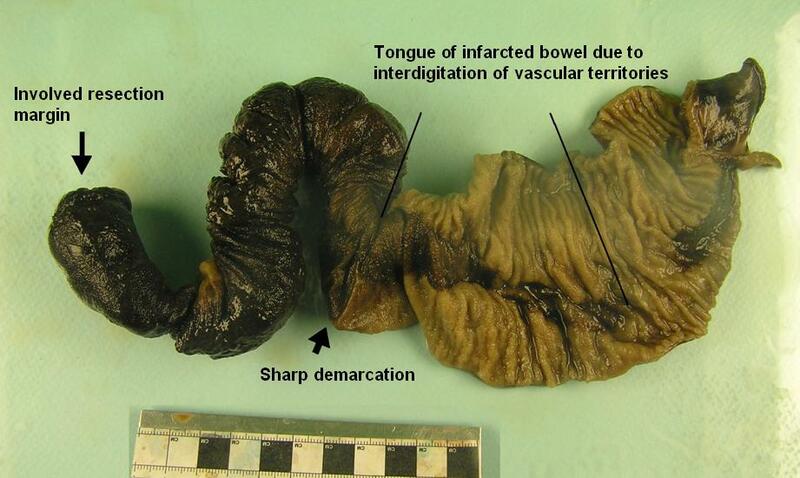 Volvulus tends to affect a sigmoid colon that has a long mesentery and is therefore free to move and twist. Diagram of volvulus, from Pathology at a Glance, Blackwell, 2009, with the permission of the authors. Vasculitis encompasses a collection of conditions in which there is inflammation of and damage to the walls of blood vessels. One of the complications is thrombosis of affected blood vessels. A colon removed for ischaemia is opened along its entire length. The changes in ischaemia are typically continuous and relatively uniform along the length of the affected part of the bowel. They are often well demarcated from the adjacent uninfarcted bowel. It is important to indicate if the macroscopic changes extend to the resection margins. If they do, there is a danger that any primary anastomosis will breakdown and fail. An example description (for an ischaemic colon) is as follows. 'The specimen comprises a segment of large bowel which measures 250mm in length by 60mm in circumference. The wall is thin, in some places being only 1mm thick. Only a limited quantity of mesentery is attached and no clearly defined high tie region is seen. 'There is widespread, continuous dusky discolouration of the serosa and mucosa for most of the length of the specimen. Loss of the normal mucosa folds is present. These changes extend to 10mm from one margin and 5mm from the opposite margin. Most of the blocks taken from an ischaemic colon follow general principles and the use of sequential longitudinal sections. However, particular attention should be paid to sampling the mesentery, even if few lymph nodes are found, in order to obtain blocks of blood vessels. Examination of the blood vessels is vital to exclude thromboembolism and vasculitis.